How to use the Windows 10 Password Reset-Disk? To use the password reset disk in Windows 10, restart the PC and wait until the Windows 10 login screen appears, the solution is also for Windows 7 and 8.1! The prerequisite is that you have created the Windows 10 password reset disk! After you have once mistyped the password in Windows 10, the text field "Reset Password" will be displayed. Here you click on it and keep the password reset disk ready. Here you can also create a new login password with which you can log in in the future. You can leave the password field also, then no password is also set. And you can work on your Windows 10 computer without a password! See also: ► ... Enable or disable secure login in Windows 10! 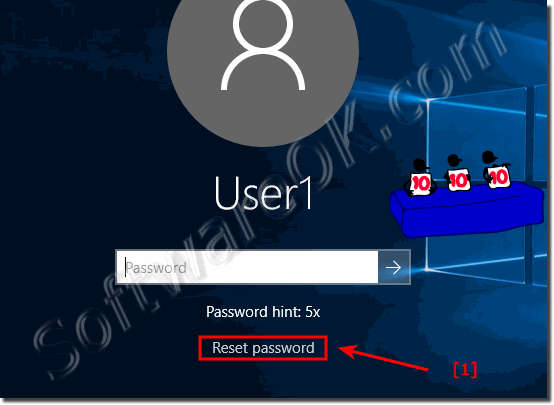 (Image-1) Use of the Windows 10 Password Reset-Disk! Windows-10 - FAQ-161: How to use the Windows 10 Password Reset-Disk?